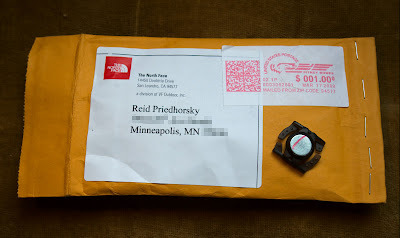 The North Face hydration systems (i.e., water-filled bags with a hose that fit into a backpack, if you don't want to be so snobby) have a brilliant system where the bite valve has a magnet on it, and you clip a corresponding magnet onto your chest strap. It's super-easy to use and way better than the Camelbak clips. "Hi, I need one of those magnets that clips onto a backpack strap." They wouldn't take my money. So now I have a second magnet. I was very impressed. Superb customer service seems to be endemic in the outdoor products industry. I had a great warranty experience with MSR a few years ago (a stove weld broke after 4.5 years of use, and it was fixed free of charge due to the 5-year warranty), and I have an ongoing warranty experience with Marmot that seems to be going very well (down sleeping bag lost loft in a few baffles). I wonder why. Generally, my customer service experiences these days run from awful to disastrous (try e-mailing Facebook support sometime). Is it because outdoor stuff is all luxury items?